Check out the new arrivals... Elegant, striking and colourful wooden jewellery designs from Scandinavia now available to buy online. Show her how much you care with this cute and feminine pink wooden necklace with heart charm pendant. Perfect for ladies who adore bright and ultra-feminine designs, the pink necklace makes a lovely gift for your girlfriend or wife, daughter, mother, sister or female friend/relative. This striking white wooden necklace is a great accessory to team up with monochrome outfits. Featuring wooden pearls and carved shapes on two leather imitation cords, the Fontana necklace will add an extra dimension of style to your outfit. 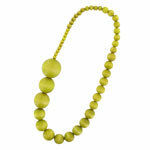 This gorgeous wooden necklace boasts a simple, eye-catching and modern design as well as a unusual colour - pistachio. New for 2012, why not add make this necklace a welcome addition to your jewellery collection. 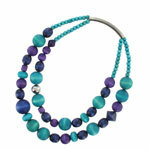 The bold and feminine Rentukka necklace is now available to buy in mixed blue. Featuring turquoise, blue and purple wooden beads, the dual string wood necklace is a great piece of jewellery to add to your collection. 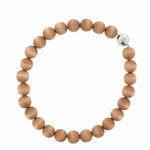 For ladies who love natural and earthy shades of jewellery, this light brown wooden necklace is elegant and understated. The light brown necklace will complement cream, brown and natural shades. If you are looking for olive green accessories then this wooden necklace is perfect for you. Crafted from sustainable wood, the Fontana wooden necklace has a rich olive green colour and a striking Scandinavian design. Unashamedly feminine and bright, this long wooden necklace will add a splash of colour to your outfit. Made from sustainable wood, the Suometar pink necklace is surprisingly light to wear, durable and eco-friendly. A gorgeous bracelet with royal blue wooden beads and silver-coloured metal detail. The blue Letkis bracelet makes a wonderful birthday, Christmas or Valentine's day gift or a treat for you! Stylish long drop earrings that will add a hint of feminine colour and sophistication. These aniline red and silver-coloured earrings can be worn at any occasion. 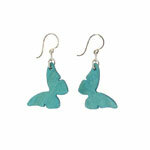 Add a touch of feminine style to your look with these eye-catching butterfly earrings in turquoise blue. At just £12, the Sinisiipi butterfly earrings make a great birthday present or stocking filler for female friends or relatives. A new colour for a new year. The versatile Marja stud earrings are now available in aniline red/pink.